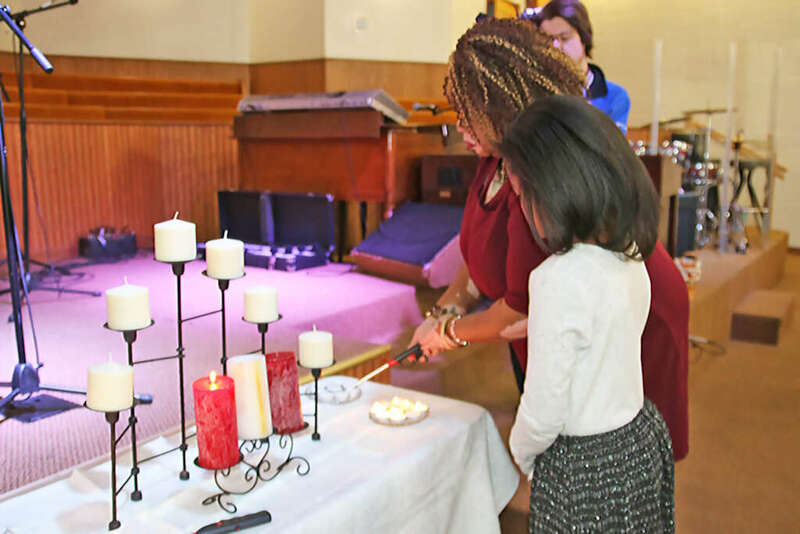 Second Baptist Church in Kalamazoo gathered about 150 residents of the area for the Third Annual Service of Remembrance and Action on Sunday, February 19. Participating in the service were leaders from ISAAC, MOMS Demand Action for Guns Sense, the NAACP and the Coalition for Common Ground, including Dr. Michael T. Scott, Pastor of Galilee Baptist Church, who presented the message. Members of the community offered musical selections, led prayers for peace and urged common sense to end firearms violence. For the first time, members of the community were invited to come forward to light candles for their loved ones killed in firearms violence and to say their names publicly to the community. Thanks to Amy Peterson for these photos that capture the power of this event. An offering of letters was received and totaled about 60 letters with a majority being written to Senator Margaret O’Brien supporting legislative actions to bring firearms sense and safety to the state. Following the service MOMS Demand Action for Gun Sense gave a presentation on firearms safety called “Be SMART”. Be smart for kids—take the quiz! ISAAC co-sponsored the event with the Coalition for Common Ground, an organization of individuals concerned about firearm violence in the state and the nation. It has been active in the Kalamazoo area for about 4 years and is part of a statewide coalition.